Influenced in the beginning by rural American culturalstyles, the classic designs of today's Carolina products are in harmony with the quality and craftsmanship expected by consumers. Bedroom products made by Carolina Furniture Works continue to reflect the charm of simple furniture traditions combined with today's trends, as well as being family owned and operated by a third generation who carry on a dedication to a family of satisfied customers. 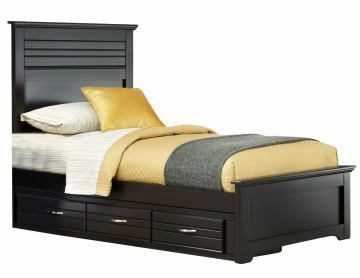 All bed components in the Platinum Collection are crafted of solid hardwood and wood veneer components in two choice finishes of either black or white lacquer. All members of the family can enjoy the versatility of this collection complimented by under bed storage units, a bedroom media option, kids and student application pieces, and styling characteristics easy to accessorize. The two simple color schemes and a limited palette of materials keep distractions to a minimum and instill a sense of orderliness and calm. Fluted panels and curves compliment bed components and create a harmony with storage units without undermining the classiness of the various Platinum case pieces. This Carolina Platin... Collection item features a video.